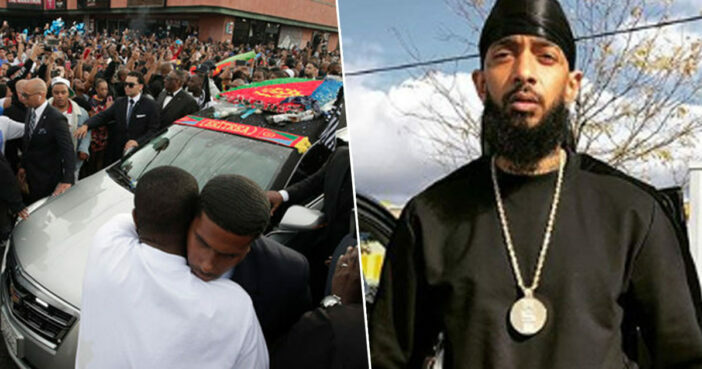 A gunfight which took place in the midst of Nipsey Hussle’s funeral procession, has left one person dead and three others injured. The victims were three men and one woman, with the shooting taking place in the Watts neighbourhood of South Los Angeles, California. The incident is thought to have taken place towards the end of the 25.5 mile funeral procession for the deceased rapper. Tens of thousands of people paid tribute to Hussle, real name Ermias Joseph Asghedom, who died March 31 at the age of 33. This tragedy is reportedly the latest incident in a noted surge of gun violence in the area of South Los Angeles. As reported by the Los Angeles Times, Police Chief Michel Moore said the suspects had fired at the victims from a grey Hyundai. Suspects in gray Hyundai fired on the victims. We must stop this senseless violence. 11 people were reportedly killed in Los Angeles in the week leading up to Hussle’s death, which took place outside his store, The Marathon Clothing. The figure equates to more than double the weekly average recorded in 2018, with approximately half of these deaths taking place in South Los Angeles. Since last Sunday 26 victims have been shot & 10 homicides—that’s 36 families left picking up the pieces. We will work aggressively with our community to quell this senseless loss of life. As reported by Pitchfork, 29-year-old Eric Holder has been arrested and charged with the murder of Hussle. He has reportedly pleaded not guilty.